Mani. Bass player with The Waterfront, The Hungry Socks, The Stone Roses and Primal Scream. Peter Hook. Bass player with Warsaw, Joy Division, New Order, Monaco and The Light. Both names are 2 of the biggest there are in the bass playing circuit. 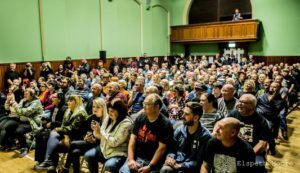 On Saturday 22 September both joined forces to hold a charity funding questions and answer session to go towards the world famous Salford Lad’s Club, heralded a social mecca to all fans of The Smiths. Matt Mead parked on Coronation Street (literally) to review proceedings for Louder Than War. All pics by Elspeth Mary Moore. Having been a fan of The Stone Roses and New Order since 1989, I first heard Made of Stone in 1989 and my first cassette album purchase was New Order album Technique from my local newsagents also in 1989. Since then I have watched with interest as both bands have gone onto global success. 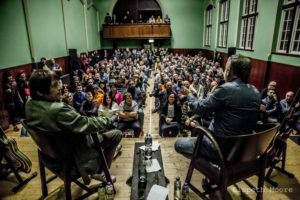 So it was with some excitement that I attended this Q&A session with 2 of the biggest names of the current music scene, especially from Manchester. Before the Q&A session got underway there was enough time to walk around these hallowed corridors of the Salford Lad’s Club. 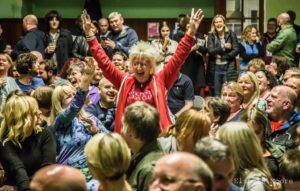 Brightly lit, immaculately looked after and with the holy shrine to The Smiths in one room, the feeling of walking on musical holy ground was evident by everyone in attendance. Walking upstairs to the main hall where the Q&A session would be held was further furnished wonderfully and had a cosy yet comfortable setting to it. 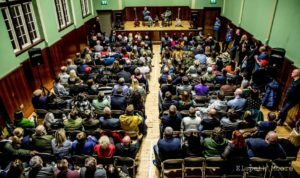 As the time crept closer to the 8 pm starting point, fever point amongst the couple of hundred folk that was in attendance was palpable. Once the clock struck the hour the homecoming champions were welcomed to the stage with deafening applause. The first hour was mainly Mani asking the questions to Peter Hook. You could tell Mani was a big fan of Peter’s back catalogue, going in-depth with some of his questions regarding Peter’s memories of events in his life of bass playing. Hooky was funny, charming and accurate at remembering all sorts of memories right back to Warsaw days and Hacienda. From talking about crowds spitting at Joy Division in the punk days and what he used to do to stop the spotting, mainly use his bass head as a useful weapon, furthermore Hooky uncovered the many millions that went into running the iconic Manchester Nightclub The Hacienda. Audible gasps were heard from the crowd when the monetary figures were said aloud. After a short break, the 2nd hour was a Q&A session between the crowd and the living legends. What I was personally hoping for was the reasons for The Stone Roses splitting again. What was evident from one of the first answers that Mani gave was he was not going to be the one to break any news regarding the split. His answer to one fan was ‘any questions regarding the Roses will be no comment’ and a further answer to a question of; will Mani be writing a book on the Roses and why they split, he again said with a heartfelt comment ‘I won’t be digging any dirt on my mates’. There in those 2 replies, we have the measure of the man. Mr Mounfield, I respect your honesty and will never look to want to know the secrets of The Roses split. Thank you. Yet, with those answers Mani did confirm Ian Brown is releasing a new record, Mani doesn’t have any plans to do anything at present, only to be a Father to his twins (‘the pay is rubbish’) and that his favourite bands from Manchester that should have had more recognition were World Of Twist, Intastella, A Certain Ratio and Northside. Good choices. All in all a truly great night that will live long in the memory for me personally as I got to meet and have my pic taken with both legends. 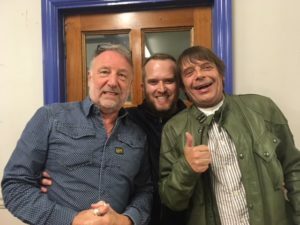 Yes, the kid from Nottingham who heard the Roses and New Order in 1989 got to meet his heroes. Many thanks to organiser Alison Bell for making that happen. 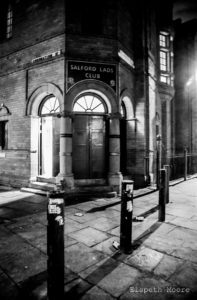 If you would like to find out more info on what’s happening at Salford Lad’s Club or you would like to donate to The Salford Lad’s Club please visit their website. You can find more work by Elspeth via her Instagram account. All words by Matt Mead. Further articles by Matt can be found at the Louder Than War author archive pages. So, Reni has destroyed the greatest band in Manchester’s history for a second time? The people of Manchester know the stories already. Mani is a top lad, sound as a pound. And I hope Ian pulls another classic out of the hat (hopefully with John Squire with him on some songs). ‘The drummer’s a c***’ as the great man said that night in Amsterdam. Very much enjoyed the read – lovely stuff & most appreciated. Anything Reni could produce, I think would be embraced, & certainly well worth putting out. Be it via some social media, or charitable means – a forthcoming record store day type thing? That would legitimately be amazing. lets enjoy their work, lets we wish them well & the best of luck. But, if folks could call on them, perhaps?